Pella is a small town in southern Iowa that is perhaps most famous for being the childhood home of American gunslinger Wyatt Earp. However, it also has a number of other claims to fame, including the Pella Opera House and Vermeer Windmill. 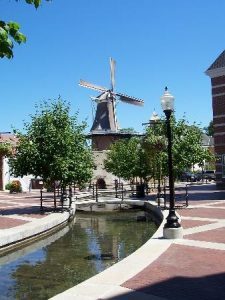 Pella was founded in 1847 by a group of some 800 Dutch immigrants, and enjoys strong connections to Dutch cultural heritage to this day. Today, the town has a population of about 10,000 residents, and covers an area of around 10 square miles. This gives Pella a population density of around 1,000 residents per square mile and a distinctly suburban feel. The following will examine some of the main pest control issues experiences in the town. The climate of Pella is classified as ‘humid continental’, which it has in common with not only most of the rest of Iowa but much of the Midwest. This sees the town and surrounding areas experience both extreme heat and cold, with summer temperatures sometimes exceeding 100 degrees. Meanwhile, the all-time coldest winter temperature was registered at -47 degrees. Pella typically experiences a moderate amount of rainfall, at about 30 inches per year. Additionally, the town and surrounds are vulnerable to extreme weather activity; southern Iowa experiences around 50 thunderstorms each year, while the 30 years historical average for tornadoes is 47. The extremes of Pella’s climate stirs up a great deal of pest activity, and the town’s residents are likely to encounter different pests in their homes at different times of year. One of the more interesting pest problems that may be experienced by Pella residents is not that of mice or termites, but bats. Although perhaps not the most common infestation problem, bats are nonetheless common in the area and have been known to nest in residential structures in and around Pella. Bats can both be a problem from late spring through summer, as they seek out more active insect populations (their main food source) during this time, and in the winter as they seek a place for hibernation. This can lead bats to settle in attics and barns, where they will roost, either as solitary bats or in colonies. Although bats are generally harmless if left alone, they can be dangerous to humans as potential, if infrequent, carriers of rabies, while the droppings of bats is capable of causing lung disease in humans. One way to identify a potential bat infestation is to look for signs of droppings, which are distinctive in that the normally contain partially digested insect segments. Of course, the bats themselves can be evidence of infestation. If nocturnal bat activity is detected close to a domicile, it is reasonable to suspect that the bats may be roosting within, or in a nearby property. To keep bats out of a building, the best course of action is to board up any possible points of entry that bats may fit through. However, if a bat infestation is suspected, calling out a pest control service is recommended. They will complete a full inspection of the property and safely remove any bat populations located within, as well as helping to bat-proof the building in question. Dowie Pest Control is a reputable pest control service capable of handling bat infestations and other pest complaints in the Pella area.